This lauded bestseller, now available in paperback, takes an uncompromising look at how we define psychopathology and makes the argument that criminal behavior can and perhaps should be considered a disorder. 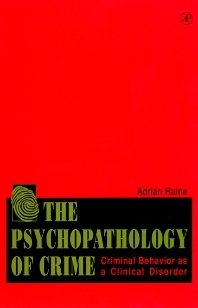 Presenting sociological, genetic, neurochemical, brain-imaging, and psychophysiological evidence, it discusses the basis for criminal behavior and suggests, contrary to popular belief, that such behavior may be more biologically determined than previously thought. Researchers, professors, graduate and advanced undergraduate students in sociology, social psychology/personality, clinical psychology, criminal justice, social work, cognition, and genetics.